This morning Dr Arul Anketell picked us all up and took us to the Health Care Christian Fellowship in the centre of Colombo for their prayer meeting. We sang and prayed; John shared a short talk (translated into Singhala) and we celebrated Carmen’s 86th birthday. It was such an encouraging time. 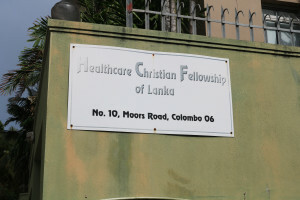 Along with discipleship and teaching on specifically medical issues the HCF are trying to raise up a generation of Christian ‘Hospital Attendants’ – in Sri Lanka Doctors and Nurses only offer emergency healthcare. It is a cultural expectation that a family member will stay with a sick relative while they are in hospital to care for their basic needs while they recover. The government has come to realise that this is impossible for many and so now there is a recognised job for someone who will care for patients in hospital. HCF see this as a great opportunity for the gospel – “… a lot more people go to hospital than go to church!” Please pray for this key strategy and for the amazing work of HCF: for their new leader, Singha, and for their up-coming conference. After this we went into the old city centre to do a little shopping. Only mad dogs and English families go out in the midday sun and at one point we had to go into one posh shop just to recover with their air-con. Wow this place is hot! Then to the local’s surprise we got the train home from Fort station to Mount Lavinia – not only did it take a third of the time of a taxi but just cost 50 rupees for all four of us (about 25p)! We even got an ocean view thrown in. Enjoying your blogs. Very brave to take the train!! Praying for all of you. Read all your blogs with great interest. What strikes us is how God has so wonderfully prepared and programmed his generous provision for you!